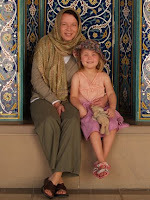 It was unusual to find several coach-loads of tourists at the Grand Mosque this morning. Large groups were herded around by guides with numbered bats exerting little control over their flocks. Although Holly was allowed into the grounds, she had to wait outside of the main prayer halls where she audibly stated that she had spotted a zebra. 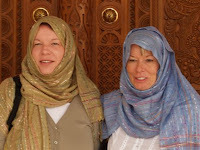 There were plenty of smiles when Holly was around, particularly from the Omani ladies. There was even more attention at the souq where a shopkeeper took her photograph and one nice chap gave her a beetle in a walnut shell toy. The municipality had obviously had the idea of recreating the odour of an ancient souq for the tourists off the ship by floo ding the main thoroughfare with drain water. Foreigners turned up their trousers and even the locals held their gowns off the ground to add to the effect. 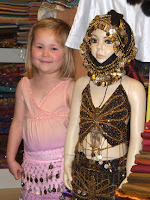 Our guests made the most of the shopping opportunity with a haul that included a lamp, sunglasses, camel leather sandals, armfuls of pashminas and a jingly frock for Holly. What seemed like hours later, we drove to the marina for a wash and lunch. We dined around the pool at the Shafaq in the evening, where once again, Miss Morris was popular with the waiters. Andy ate for England. We slept for England too.